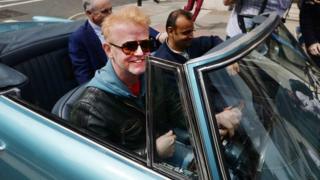 The BBC's director general has said he hopes Top Gear's "edge" and "sense of danger" will continue when the show returns with Chris Evans hosting. Tony Hall said he was "thrilled" Evans was replacing Jeremy Clarkson, who was sacked after punching a producer. He also said he hoped the new Top Gear would appeal to existing fans and bring in people who were "put off by part of how the programme was in the past". "I'd like to see some women in the presenting team," he added. Top Gear's close-to-the-knuckle humour and high-octane stunts are all part of the attraction to the show's 6.5 million viewers. But it has a long history of controversy under its previous stewardship, including accusations of racism and inappropriate comments. Speaking on the BBC's Andrew Marr Show, Lord Hall said he believed Evans would be able to reinvent the show as he knew "what makes a good programme". "I hope that edge will be there and that sense of danger will be there. I need to leave it to Chris and the team to make up their mind about what they think is going to work best," he said. "You've go to trust the talent and give them confidence to do the things they want to do." Lord Hall also denied knowledge of claims Clarkson was offered his job back as the host of Top Gear, after the presenter told The Sun an unnamed BBC executive had "asked if I'd come back" last week. "I have no idea what that's all about," the director general said. "I made it absolutely clear when I said 'we're going to part company' that was it." Clarkson's final episode of Top Gear will be broadcast on 28 June at 20:00 BST on BBC Two.